Nice cup has the Esquire pattern in brown (usually found in blue) on Carr’s Glo-Tan body for a handsome, rugged look. 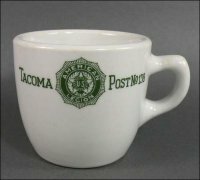 The stacking cup is about 4 ½” across, including the handle, and stands about 2 ½” high. It has light-to-medium use marks and has something of a nice patina of age about it – a well-used look with slight dulling of the shine.